The NHS is ‘the closest thing the UK has to a national religion'. No wonder: it has worked secular miracles. Before the NHS, sick children could not see a doctor before a sixpence was handed over. People died of whooping cough and tuberculosis, illnesses we now scarcely see. When the NHS was founded, almost 70 years ago, people in the UK lived less than 50 years on average – a lifespan which has almost doubled. No matter how poor we are, our health care is included with British citizenship. But the NHS has also been accused of high death rates, lazy and uncaring staff, dirty hospitals and unbridgeable funding gaps. Every politician claims to know how to save the NHS. Margaret McCartney argues differently. She believes that the NHS is world class: but politicians have to stop micromanaging based on faith in their own political beliefs and instead base decisions on evidence. Patients and professionals working together to deliver an evidence-based NHS is the only future – if we want our NHS to survive. 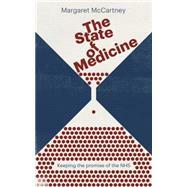 Margaret McCartney is a regular contributor to the British Medical Journal and Radio 4's Inside Health, as well as other newspapers and journals. She is a GP in Glasgow and the author of two previous books.